This is a commonly requested new feature in the upcoming OracleBI Spreadsheet Add-in 10.1.2.2. 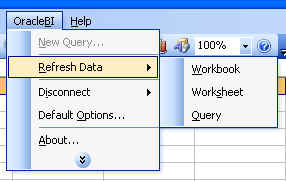 A new menu option now makes it easier to work with workbooks that contain more than one query. As you might know, it is possible to create more than one query in a worksheet in a workbook. 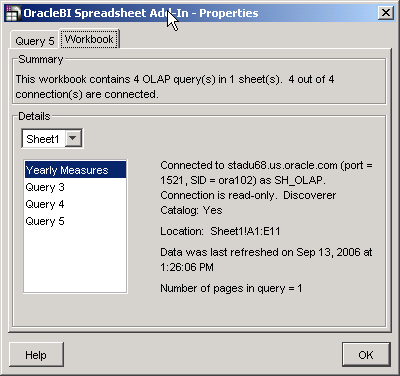 Each query can have it's own connection, so it is even possible to run against more than one database from within one workbook or worksheet! Of course, if you have multiple queries, you might want to reconnect/ refresh them all in one step. This new feature in version 10.1.2.2 does exactly that. When you open a workbook with multiple queries, you now have following menu options available: OracleBI->Refresh data, then Workbook, Worksheet or Query. 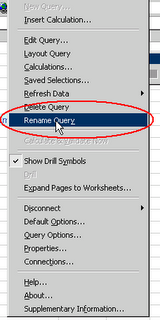 If you pick Workbook or Worksheet and multiple queries are involved, the login dialog will be displayed. 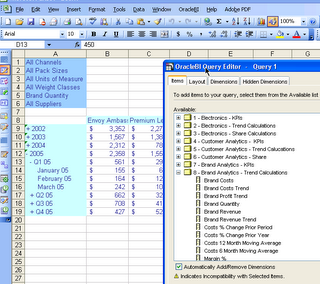 It might be displayed multiple times, if the queries have different connections. Once you have typed in username/ password, the add-in will loop through all the queries, and reconnect/ refresh the data. In the lower left corner you will see a message on the status bar, that will display the name of the query being refreshed. 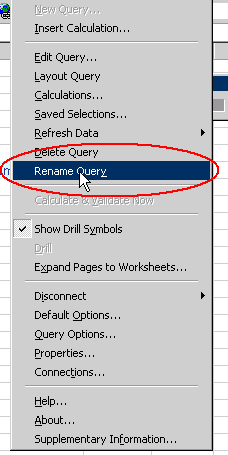 As Abhinav mentioned, you can now rename queries, so instead of seeing "Refreshing Query 2..." you might see "Refreshing Sales Query 2006..." and so on. Following up on my last post ("Why Is the blog getting so many hits"), and in response to William Robertson's comment, here are some stats from StatCounter. 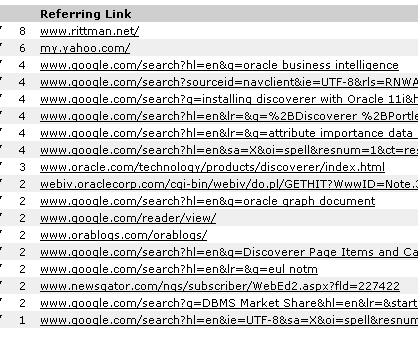 As you can see, a lot of links are coming from Google, so looks people are searching for stuff, and finding the blog appear on the search results, and find their way here. 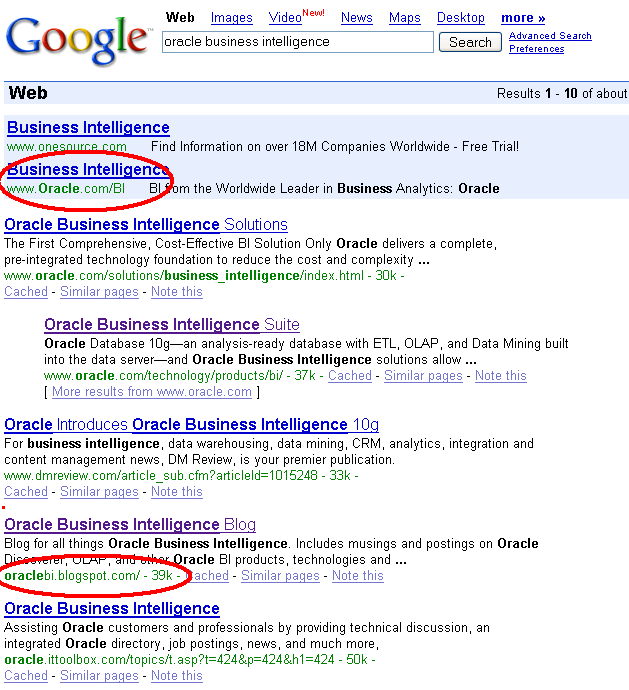 For example, if you search for "oracle business intelligence", while the first couple of results are from Oracle.com, the third hit is from the BI Blog. 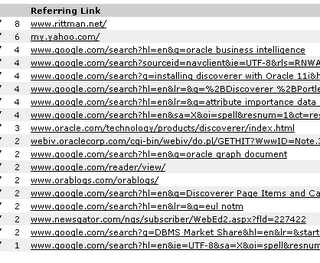 Also, Mark Rittman's blog is a popular blog that people come from. 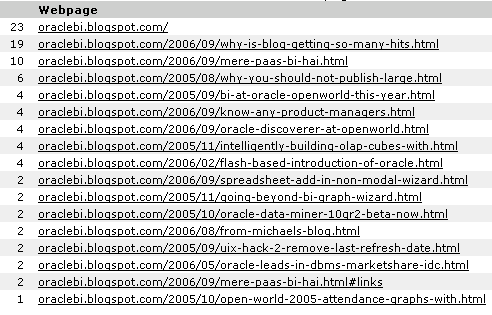 At the risk of extrapolating the last 100 hits to be representative, it seems that more and more hits to the blog are coming from searches. 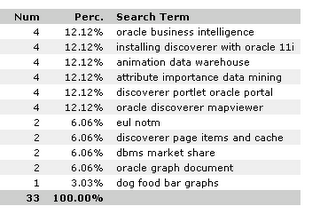 Though I can't figure out just how someone searching for "dog food bar graphs" landed on this blog! 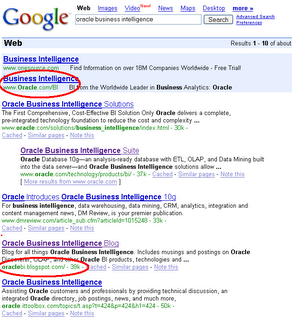 Search and you find that this post is the culprit, and that too it is the second search result! Short post before I get to work (am visiting Oracle at Redwood Shores in the US this week, so thanks to jet lag, getting in to work by 7AM is a breeze!). 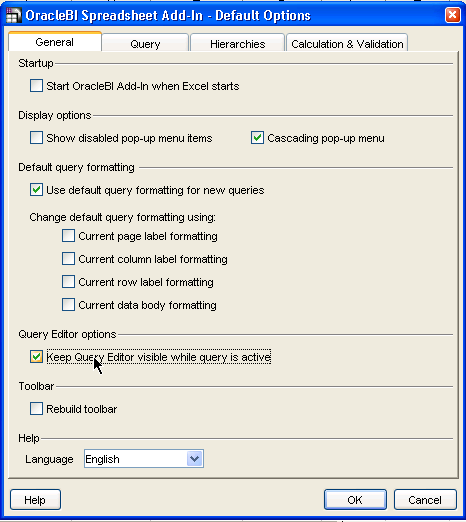 This mode of using the query wizard is not enabled by default. 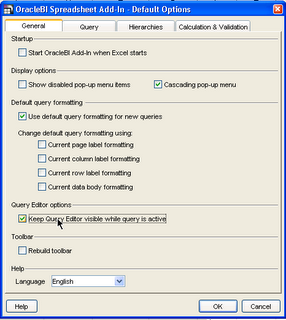 To enable it, you have to go to the Add-In default options screen, to the 'General' tab, and check the option that says "Keep Query Editor visible while query is active". 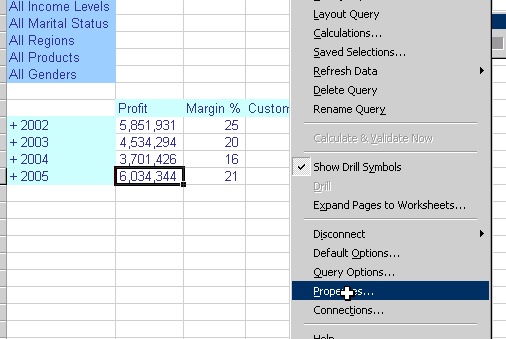 Once you do that, the next time you launch the query editor wizard (edit the query, add a calculation, change the layout, add a saved selection (more on that later - yes, you can now add and save and reuse saved selections from your Discoverer D4O catalog!! Yippee! 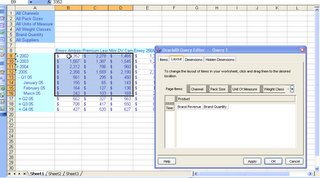 ), etc...) a smaller sized query editor is launced, placed at the right bottom corner of the Excel window. 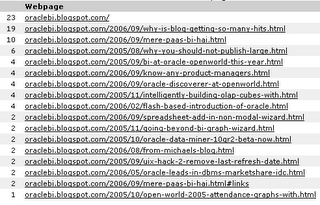 Thanks Abhinav for that welcome to the Oracle BI Blog. By way of introduction, I've been at Oracle for nearly 10yrs - in fact, it will be almost 10yrs to the day while at OpenWorld. I can safely say that no two days have been the same and it is still an exciting place to work. 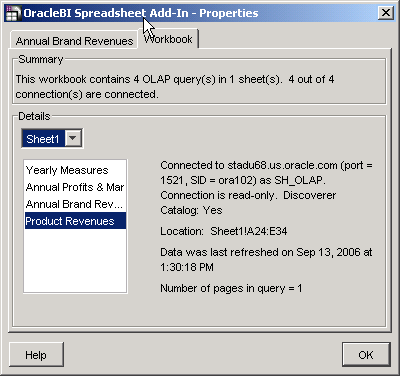 I started out in BI consulting and worked on various projects implementing relational data warehouses, and OLAP systems using the Express multi-dimensional data base - this was mostly for Sales Analyzer implementations. I also started using the Discoverer 3.0.7 limited production release. The great thing about working on BI projects is that you get to learn about a lot of different industries and I found myself working in banking, telecomms, travel and the pharmaceutical industry. 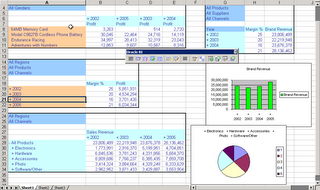 I made the move into BI product management 6yrs ago. 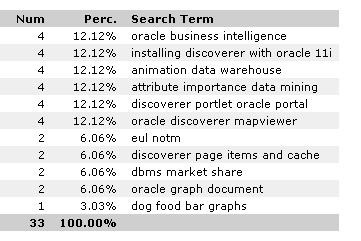 Prior to Oracle, I completed a PhD in computational chemistry. If you are attending this years OpenWorld, then please come along and say 'Hi'. My recommendation is to book your place at any sessions you are interested in well in advance. I know that mine is already half-full. See you in October! Welcome Mike Durran, Discoverer and BI product manager, based out of Orace's Bristol development center in the UK, and the latest to join the BI blogworld! Keith and I have blogged about the upcoming Oracle OpenWorld conference (link to page on Oracle.com) in San Francisco next month (Oct 22-26 2006). This year, the X-Treme program (link) offers highly technical, deep-dive content through a series of intense breakout sessions and X-Treme hands-on workshops. 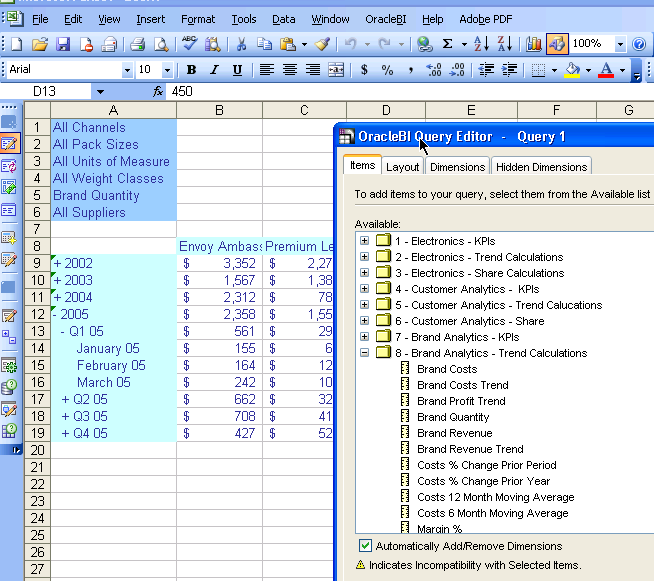 It covers twelve tracks on various topics including business intelligence. 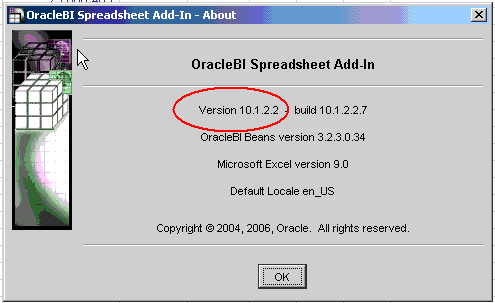 The BI track (link) shall cover Oracle BI Suite Enterprise Edition (link to product page on OTN). 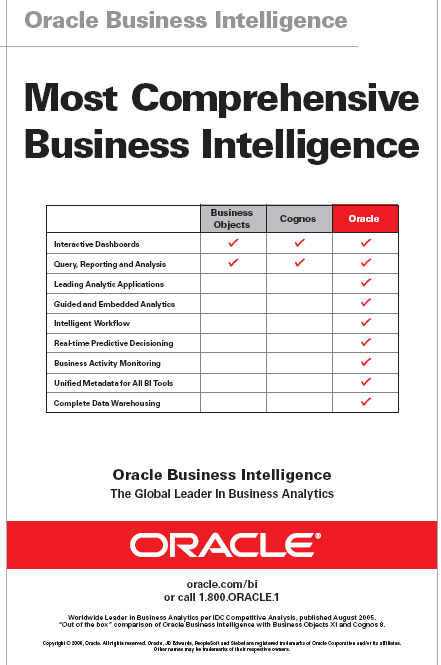 There, "you will learn how to use the components of Oracle BI EE, including Oracle BI Answers, BI Dashboards, BI Advanced Reporting, BI Delivers, and BI Server Administration. 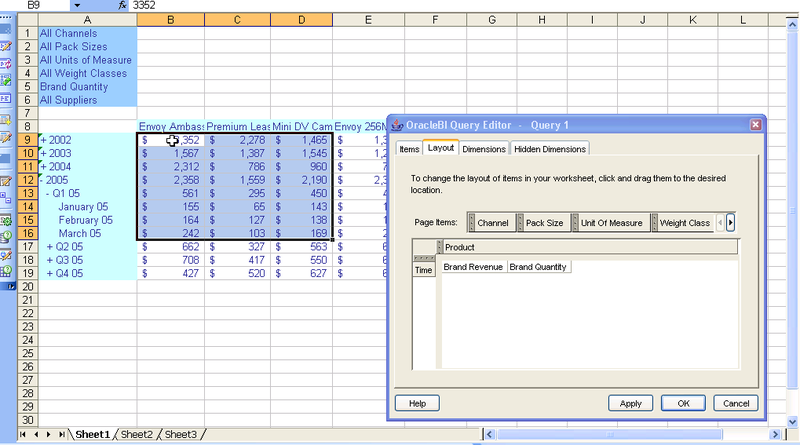 Join us for deep-dive BI hands-on workshops that you won't find on the regular OpenWorld agenda." This is an awesome way to learn more about the products and meet the people behind the products (except me, I shall not be attending OpenWorld this year ). You get to meet the product experts, and get to hear from them about the current product release, upcoming releases, roadmap, and more. Of course there are many regular conference sessions, presentations, and keynotes that shall cover this, but at the X-Treme program you get to meet the product experts even before the conference begins (remember, the X-Treme session starts on Oct 21 and end the next day on Sunday, Oct 22). Click on the banner above or click this link to learn more about and register for X-Treme. Here is a link to all the special programs on offer at this year's OpenWorld. Discoverer 4i shall be desupported for EBS11i by the end of October. For more information please read Steven Chan's blog post (link to post). Also read this more detailed post by Steve (link). 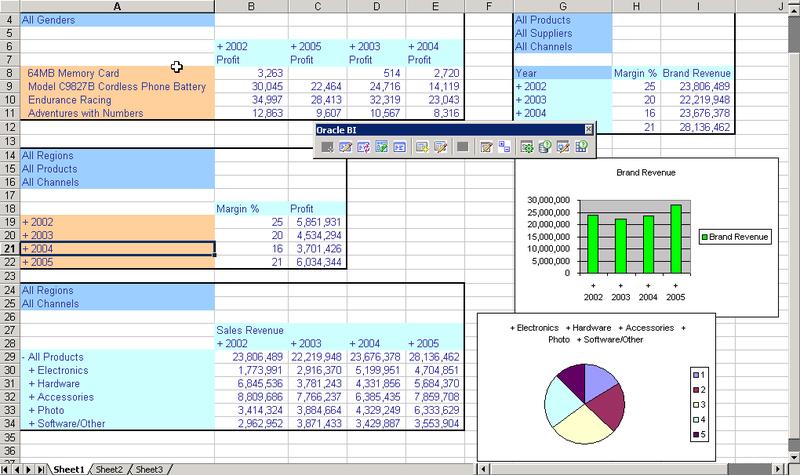 See Michael's post (link) - if you use any Office applications like Word, Excel, Outlook, PowerPoint, Project, Visio, InfoPath, SharePoint, etc... in the context of viewing business intelligence data - like pulling data from a data mart or data warehouse or even an ODS; if you then embellish it with Excel calculations, or charts, or create Pivot Tables; if you create PowerPoint presentations from the data; if you regularly receive emails containing summarized data or reports - let Michael or myself know. 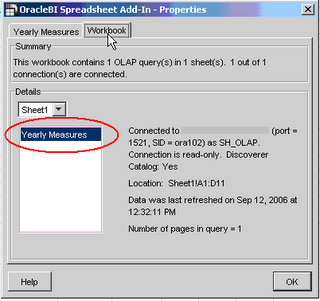 Drop me an email at abhinav.oracle@gmail.com. 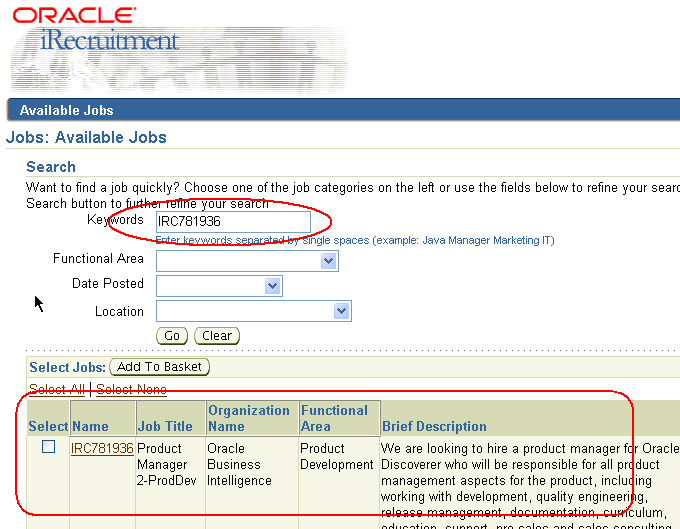 And oh yes - if you are interested in and think have what it takes to be a product manager and want to work in Oracle's BI product management group - do let me know (again, drop an email at abhinav.oracle@gmail.com). 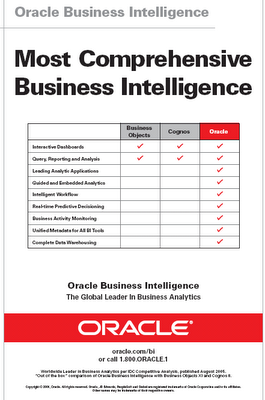 If you know of people who are qualified and interested in working as product managers for the business intellligence product management group at Oracle, let me know. While I am more interested in a PM specifically here in Bangalore, there is a need for product managers at other locations also - in the UK and in the US. So here is your chance to say "hey - I helped define the best and the #1 BI suite in the market" or "you know that person? I recommended him for that job - the best product management job in the software industry!". 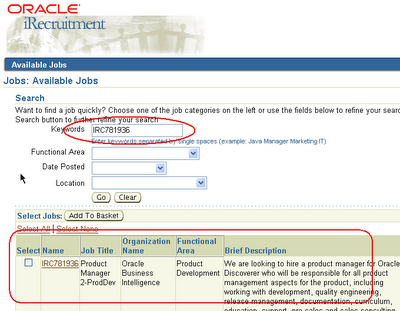 Enter the keyword IRC781936 to get to the job posting.